It's me again, the writer to the old introduction in this forum. This time, I'd like to introduce a character directory that you guys can use if you want to keep a definitive character. They're subject to change over time, naturally, but if you need to refresh someone's or your own memory, feel free to drop by here. Photos appreciated. Alias: Different names like nicknames or secret identities. Gender: Male, Female, one of those four Andorian genders, or even one of Species 8472's five genders. Age: The number of years your character has lived. If they are from a particularly long lived race like the Vulcans, it may also be appropriate to list a human equivalent in brackets. Alignment: Like D20 games like D&D, you can choose to generalise your character's beliefs and morals, or lack thereof, as an alignment. Lawful/Neutral/Chaotic, Good/Neutral/Evil. Class/Profession: Characters may have a wide variety of skills. For Star Trek purposes, you can name them Engineer/Science/Tactical. Description: A physical description of your character. It's good to be detailed and specific. Most people find it easier to roleplay if they can get a better picture of the characters involved, and it's easier if you've given them more than 'brown-haired Caucasian male wearing M.A.C.O. Battle Dress Armour'. Clothing can possibly go here, if your character's wardrobe is of the limited variety. Image links greatly appreciated. Personality: Everyone is different, and it's rare that two people will approach a problem in the exact same way. Unless they're like, super-clones or something. Like alignment, this should not be treated as a shackle. Sometimes people can act against type, especially in stressful situations. This field is also more optional than the others. Equipment: Your character's loadout. Armour, weapon, hyposprays, tricorder, and other devices that your character routinely carries with them. Abilities: Your character's skills and abilities. What can they do? What weaknesses do they have? It all goes here. Backstory: Simple. How did your character come to be? "To Come Later" is an acceptable substitute for a long and extensive backstory. Even Especially if you conveniently 'forget' to develop it. Miscellaneous: Anything else that you want put down. Remember kids, the difference between TRIBBLE around and science is writing it down. is this a good character? Abilities: He knows a lot of martial arts. Miscellaneous: Leads an armada that is slowly and covertly taking over the galaxy. 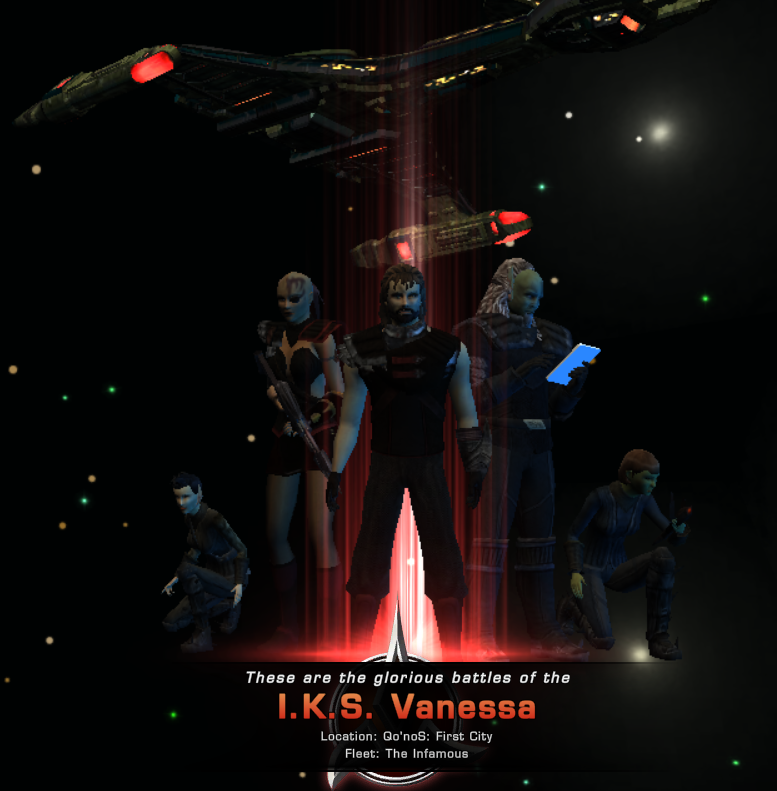 Ships: B'rel class Malevora, Vor'cha class Vanessa, BortasQu class r'Llaillieu Returns, the Somraw raptor Abigail, and the K'Tinga D-7 battle cruiser Ruth. "To the Stars, despite adversity"
Description: A squat stout Ferengi with a devilish smile and a bit of a paunch. Personality: Quick witted, sarcastic and smarmy. He approaches all social encounters like meeting an old buddy. Equipment: Phaser he calls the Motherwrecker. Backstory: After several failed business ventures, Zex caught a documentary about the exploits of Captain James T. Kirk, and saw an opportunity and an epiphany of what constitutes "profit", and gambled it all and lost a lot enrolling in Starfleet...costing him business holdings, his wife, and a hit to his reputation within Ferengi society. Miscellaneous: Most of his ships are named after famous businessmen or con artists. Description: Tall, athelitclally built, with pale blue eyes, and dark blonde honey coloured hair. Fair skinned. Personality: Steadfast, kind hearted, always set on doing the right, moral thing. Abilities: Heck of a pilot! Has a modicum of first aid training. Backstory: Originally born in the mid 20th century, she joined the United States Air Force on graduating high school. After earning her commission, she was sought by G.I. Joe commanding officer Colonel Clayton "Hawk" Abernathy in 1982. Olga proudly served for 3 years, until she encountered a temporal anomaly in 1985, throwing her centuries into the future. Miscellaneous: Being from the late 20th century, Olga is prone to discuss it, much to the chagrin of close associates. Also tends to annoy agents of Starfleet's Department of Temporal Affairs, but loved by historians because of this. She is still getting herself properly acquainted with 25th century tech.